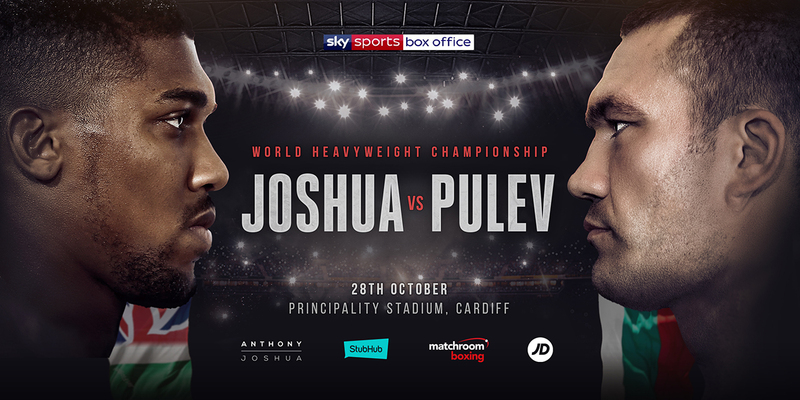 Anthony Joshua MBE will defend his World Heavyweight titles against Kubrat Pulev at the Principality Stadium in Cardiff on October 28, live on Sky Sports Box Office. Joshua returns to the ring following his epic battle with Wladimir Klitschko at Wembley Stadium in April where the Brit added the WBA strap to his IBF belt in an enthralling contest with the future hall-of-fame legend, climbing off the canvas to record an 19th straight KO win in front of a record-breaking crowd in London. The unbeaten Olympic gold medal hero will now tackle his IBF mandatory Pulev, the Bulgarian rated number one in the IBF facing his second World title challenge having faced Klitschko for the IBF title in November 2014. ‘The Cobra’ became a two-time European champion after the fight with a win over Dereck Chisora, and the 36 year old picked up and defended the WBA Inter-Continental title with wins over two former World title foes of ‘Dr Steelhammer’ in Samuel Peter and Kevin Johnson. “Anthony is a great champion and his last fight ignited the division,” said Pulev’s promoter Kalle Sauerland. Mark Williams, General Manager at Principality Stadium which is owned and operated by the Welsh Rugby Union, said: “Our national stadium is a true Heavyweight when it comes to bringing major events to Cardiff and today’s announcement strengthens our status as a year-round, multi-events arena, in the heart of a city-centre renowned for delivering a Welsh welcome to visitors from around the world. An announcement on ticket prices and on-sale dates will be made this week and the first undercard fights will be released in the coming days.